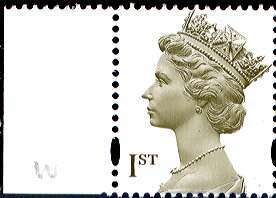 The Royal Mail The Millennium Definitive was issued on January 6th, printed in sheets of 200 by De La Rue, and also in books of 10 printed by The House of Questa and Walsall Security Print. 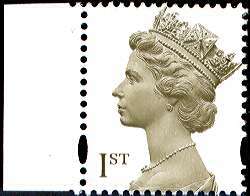 From the outset, collectors suspected that the stamps from the different printers would be identifiable, despite the seemingly uniform design. "Because the millennium Machin head has no background there is no 'frame'. To fill the space and maintain aspect ratio, part of the image had to be omitted; the part chosen was the base of the portrait, i.e., the corsage. However, the amount omitted differed with each printer. This is best seen by looking at the space between the base of one image and the tip of the diadem on the images below. While these differences are minimal, they are constant and are just one of the features by which singles of the different printings can be distinguished. Thus, collectors can defeat Royal Mail's intention of having three printers create identical images by supplying them with the same digital head on a CD ROM. " 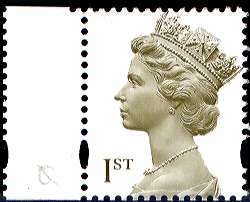 These enlarged images of parts of the stamps might help collectors to distinguish single stamps in their collections. I hope this page is useful; if you have any other quesions, please e-mail me.